""" keywords'/> "" " So, You Wanna To Remain A Struggler | Then Don't Read This Secret | Best Actor Academy-The Monster Of Free Acting Tips ""
What's the secret to becoming a good actor? To achieve this goal, you are working hard day in and day out. But are you a successful great actor and happy? Most of the actors NOT! 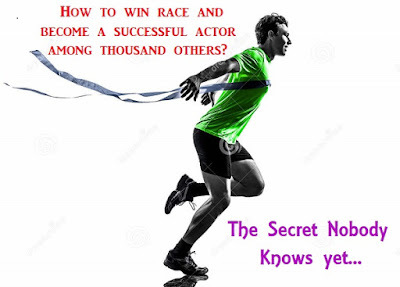 How To Achieve Your Cherished Dream To Be A Successful Actor? Know your type- who are you? How To Develop An Excellent Acting Ability? This instrument of everybody is "SET", which creates in you an “Essence”, an archetype which makes you a unique human with different physical, mental and behavioral type and attitude. It's absolutely essential to know your type to help you to decide which "character type" can you portray and will prefer to for those auditions which need a character of your archetype. If a person has to perform a fictional role in a situation to meet the objective, a new interesting life, a new character has to be created after analyzing the situation. This new role must be played truthfully and convincingly. However, the biggest hurdle in this sincere endeavor is his “own self”, his essence, his/her “type”. The more an actor tries and forces self to act in the best possible way, more it looks an “acting” and fake. The actor’s “self” like his/her body language, voice, gestures, attitudes, emotions etc come in the way to transform convincing into a character which an actor has created by his/her imagination. Then, how an actor can transform into an authentic character which looks real? How An Actor Can Neutralize And Free Him\Herself To Portray A New Life? Keep in mind, they are known today and would be remembered for generations first by their names and then by the characters they have played or awards they have won. However, these celebrities too focused on changing from “ self”- a common person, to transform and present an astonishing and highly creative performance giving a memorable character to the viewers thus lifting a film to incredible heights. 1.Observation: Set time for observing very keenly people, birds, animals, objects at public places like the bus stop, garden. metro rail stations, zoo, museums etc. Relax. Close your eyes and put your finger on a word. Look at the word and create a story, experience, a related scene. "Watch films, watch plays, watch people, keep it real and be positive. The rest is up to Dionysus". Mukesh Chhabra casting co. on Facebook.